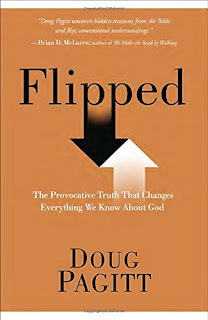 It's hard not to be intrigued by a the title of Solomon's Porch pastor Doug Pagitt's new book, Flipped: The Provocative Truth That Changes Everything We Know About God. Inside, Pagitt promises that he'll be telling a story about Jesus and how revolutionary His words were when he lived and now, if taken in their proper context. That context, Pagitt contends, is one in which we Christians are "In God" and where we live, move and exist in Him. This is in opposition to the prevailing religious story of a transaction-based relationship between us and God. I love this line of thought. And I wanted to read more about the author's view of being in Christ (as opposed to simply Christ in us), which he hints is that revolutionary truth that changes everything. In his third chapter, Pagitt writes, "The preposition in is a profoundly meaningful word. And flipping the order of words from 'God is in all' to 'all is In God' is more than a semantic move. It offers a clearer, more honest, more biblical understanding of who God is and who we are In God" (40). At this point, I'm hooked. I want to know more about this more honest understanding of God. And the editor in me wants to know why the heck he keeps capitalizing "In God." But, alas, Pagitt left me hanging as he writes his way down one rabbit hole after another with a story about a woman who found it difficult to articulate her budding spiritual renewal to her smart alec son, that author's visit to a Buddist temple that blatantly discriminated based on gender, to his recent experience opening his hip at a yoga session. He closes the chapter by flipping his own original emphasis on being "In God," by asserting "The question to pursue is not 'In whom or in what does God reside?' Rather, we need to ask 'How integrated are we with God?'" (48). It's a good 30 pages before Pagitt returns to the idea of integration. Another recurring idea in Flipped is that Jesus liked to turn tables with the familiar line, "You have heard it said, but I say to you..." (2). I had hoped Pagitt would use this as a means to organize the book, going through each time Jesus flipped his followers' and foes' understanding. Pagitt's style is far from systematic. He's more of an impressionist. And in this flowing style, he flips several familiar Bible passages in interesting ways. First, he suggests that the Old Testament account of Abraham taking Isaac up the mountain as a sacrifice was on the suggestion of the gods of his old Chaldean religion. In the passage, Pagitt says, the plural word Elohim is used when God instructs Abraham in this apparently horrendous sacrifice. However, Yaweh is the one that stops him mid-knifing. This is interesting, and would certainly put to rest many pesky questions I've had about this portrait of God. But Pagitt fails to include even one scholarly reference for any of this interpretation. I'm not a Hebrew expert. But a flip through Strong's Concordance will tell you that Elohim is used to refer to God in Genesis 1:1. So how exactly does Pagitt propose that its use indicates pagan gods in the Abraham story? I'm not say his interpretation isn't compelling, but without more support, I'm not fully flipped on this one. Secondly, Pagitt flips the story of the widow who gave her last two coins in Mark 12. Though commonly held up as a pinnacle of faith, generosity and simplicity, the author contends Jesus used this woman as a cautionary tale, the victim of a religion that takes and takes and takes until people are fully spent without actually knowing the God within whom they exist. Again, Pagitt doesn't rely on any other theologian for his reframing, but he does provide compelling context by referring to Mark 12:40 (one verse before the widow story), in which Jesus condemns the religious teachers who probably benefited from her offering, "Yet they shamelessly cheat widows out of their property and then pretend to be pious by making long prayers in public." While Flipped is regrettably light on research and contains some eyebrow-raising content, such as a physics lesson on E=mc2 and the author's aura reading, I did like Pagitt's emphasis on loving well over preforming well. In his chapter "Love Is Never the Wrong Way," he writes that Matthew 5:48, in which Jesus says "Be perfect as your heavenly Father is perfect,' he was saying 'Just as God is perfect in loving all people, so are you to be perfect in loving all people'" (111). It seems like a fanciful stretch at first, but Pagitt points out our tendency to treat verses as stand-alones. The "be perfect" directive appears on the heels of one of Jesus' most radical flips: to love our enemies and pray for those who persecute us. 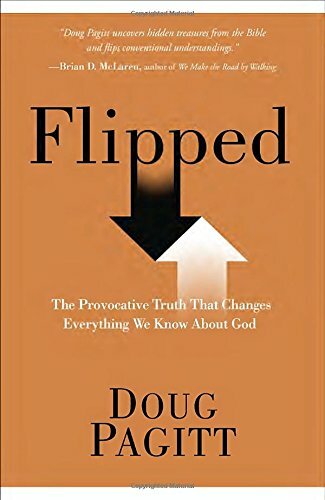 Flipped does not definitively flip my view of the meaning of life, the universe and everything, but it invites me to look over familiar Bible stories through a "Jesus-flipped lens."